Hundreds of South Valley residents braved the winter chill to honor more than 1,000 deceased veterans in several cemeteries by laying Christmas wreaths on their graves the morning of Saturday Dec. 10. 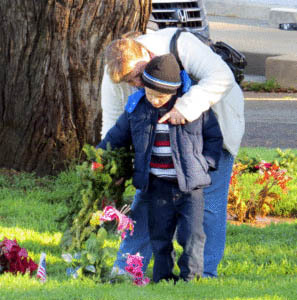 The annual Wreaths Across America event brought families and individuals together in somber ceremonies placing the holiday decorations at St. Mary and Gavilan Hills cemeteries in Gilroy and Mount Hope Cemetery in Morgan Hill. 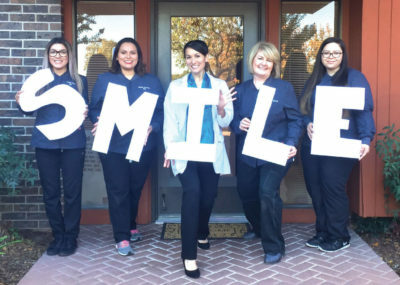 “We encourage individuals and businesses to participate because it’s a great way to remember what military men and women have done on our behalf,” said Mark Turner, CEO and president of the Gilroy Chamber of Commerce and an organizer of the ceremony in the South Valley. Wreaths Across America is a way of honoring those who served and who still serve in our Armed Forces, Turner said. 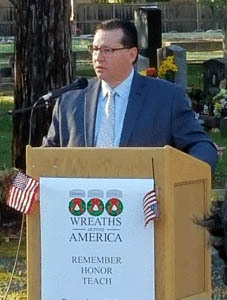 Mayor Roland Velasco speaks to the crowd at Gavilan Hills Cemetery during the nationwide Wreaths Across America event. Turner’s father, a former member of the U.S. Marine Corps, played a big role influencing his sense of patriotism. The veteran flew the flag every day in front of the family home and taught his son that America provided the greatest opportunities for everyone. At Mount Hope, Morgan Hill resident Tere Johnson began the ceremony with a special U.S. Marines color guard flag salute. The three men came from the Gilroy recruiting station to honor the veterans. This year marks the 25th anniversary that the wreaths were laid out in Arlington Cemetery. The event spread across the United States over the next quarter century. 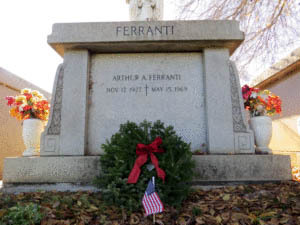 Dec. 10 about 800,000 wreaths were placed around 1,200 cemeteries in America. 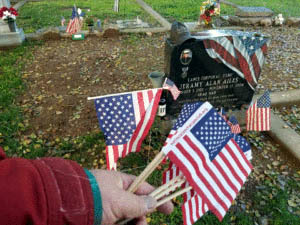 Last year was the first time the event was held in the three South Valley cemeteries. Contributions from businesses, veteran groups and individuals went to the purchase of the wreaths, which cost $15 each. The Ford Store in Morgan Hill especially provided a generous corporate gift for the wreaths, Johnson noted. Morgan Hill City Councilman Larry Carr attended the Mount Hope Cemetery laying of the wreaths and said he was impressed with the nearly 100 people who braved the cold to attend. Carr said he was glad to see children of various ages as wreath-laying participants because it is important for young people to understand the struggles and sacrifices veterans and holidays go through. It’s especially important to remember the deceased with the wreath ceremony because Christmas time can be emotionally painful for families who have lost loved ones in conflicts around the world, he said.